Bhubaneswar: Xavier Center of Urban Management and Governance, (X-UMG) will be hosting its annual business conclave, Samavesh, on August 10th, 2018, which is organised with the aim of facilitating greater interaction between students, academia and the industry. The conclave intends to induce the students of UMG to deliberate over the theme for the event, which is, “‘Complex Cities’ – Managing Urban Challenges”. Many of the economic, social and environmental challenges that we are facing have a strong urban dimension. Rapid population growth, aging population, shrinking and growing cities, climate change, biodiversity loss, disaster risks, migration, unemployment, and social exclusion are some of the major problems affecting citizens living in the urban environment. Thus, making cities inclusive, safe, resilient and sustainable is a global objective that requires innovative and integrated solutions, by promoting multi-stakeholder cooperation within a multi-level governance framework. The conclave will be graced by several eminent industry veterans who will be addressing this issue and sharing their perspective with the students. The speakers include, Mr. Susanta Sharma (Head, Global Alliance-Smart Cities, TATA Projects), CA Shomdip Ghosh (Darashaw), Mr. Kamlesh Yagnik (Chief Resilience Officer, 100 Resilient Cities, Surat), Ms. Annie Philip (Lead, Compliance and Regulatory Policy, Saahas Zero Waste), Mr. Ripu Bhanjan Singh (Monitoring and Evaluation/Knowledge Management Specialist, USAID), Mr. Sai Vidya Sagar Manthina (Vice President, FluentGrid Ltd.) and Mr. Kiran Kumar HM (Deputy General Manager, Smart Cities and Safe City, L&T). XUB believes in offering a platform for quality discussions on emerging issues and trends. The university organises a plethora of superlative conclaves to ameliorate the students’ learning experience. 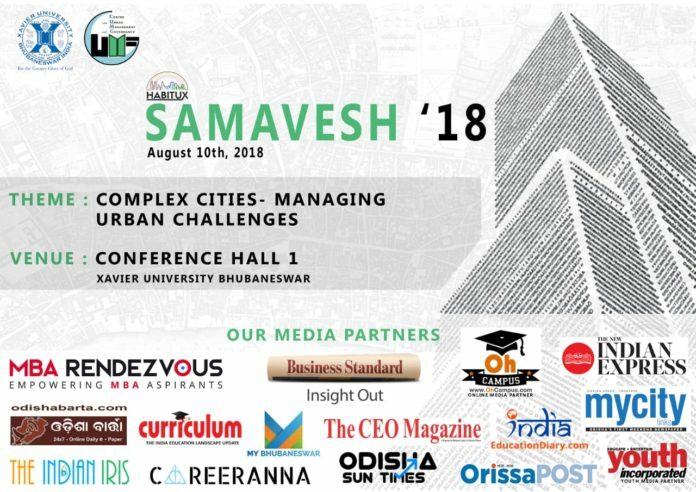 Samavesh is one such business conclave aimed at providing an enriching interactive session with respect to managing urban challenges.